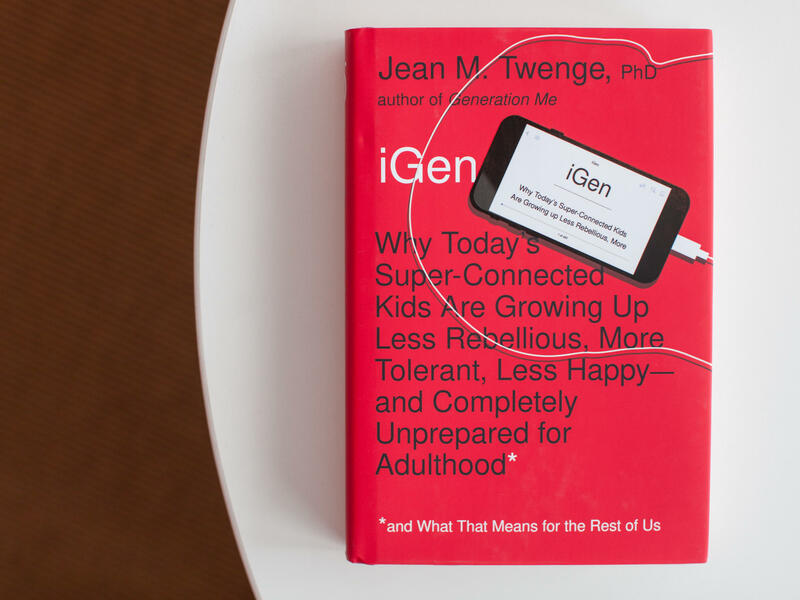 Coming to shoulder the burden is a generation the psychologist Jean Twenge calls "iGen" — like iPhones, but people. They love not only iPhones but also a number of other things beginning with i, such as individualism, irreligiosity and (we're straining a touch here) "in person no more." Twenge defines them thus: "Born in 1995 and later, they grew up with cell phones, had an Instagram page before they started high school, and do not remember a time before the Internet." Twenge gives away most of her argument in the book's ponderous full title, which is iGen: Why Today's Super-Connected Kids are Growing Up Less Rebellious, More Tolerant, Less Happy – and Completely Unprepared for Adulthood – and What That Means for the Rest of Us. In short, Twenge believes that smartphones and other screens promote antisocial behavior, prolong childhood and increase loneliness, depression and political disengagement. If this sounds familiar, you may have encountered her book about millennials, Generation Me: Why Today's Young Americans are More Confident, Assertive, Entitled – and More Miserable than Ever Before, which covers similar ground with the similar cocktail of exaggeration and alarmism that landed her national media coverage, including spots on NPR, Good Morning America and recently The Atlantic, which ran part of her new book in a recent issue. Intergenerational carping is one of our great human traditions, like storytelling, or art. With it, we relieve anxiety around aging and mortality, and congratulate ourselves at being better than our replacements. The young may inherit the earth, but we will tell them they're doing it wrong until our very last breaths. Twenge has distinguished herself by monetizing this instinct; she drops a plug for her business, iGen Consulting, within the first few pages. With her consulting business and her chapters on how to best market to millennials, she positions herself as an expert in selling things to teenagers. That the book's two apparent ends – helping kids and inducing them to buy things — might be opposed does not seem to have occurred to her. But no matter. The real problem with iGen is that Twenge draws her conclusions first and then collects evidence that supports those conclusions, ignoring evidence that doesn't. It's a mix of polls, anecdotes, interviews and material gathered haphazardly from various online sources, but the one thing that unites the book is Twenge's sloppiness. For instance, Twenge argues that young people have become increasingly self-absorbed since the advent of the Internet. One piece of evidence she uses is a search she ran through Google's Ngram (which searches through printed books) for the phrase "I love me." She found a sharp spike in the phrase in the last few decades. But "I love me" sounds slightly off — surely most people say "I love myself." And lo, if you search "I love myself" (as I would guess Twenge did first), you find that the phrase fluctuated with much less satisfying results, and in fact occurred at a higher frequency in, for instance, the 1770s, than in the early 2000s. So, Twenge discovered a grammatical shift and disguised it as a cultural one. It's a small example, but the book is dizzying with this brand of deceptive spin. She also often treats correlation as if it were causation, and likes to make speculative comments and then proceed as if they are fact. For instance, she writes that an online commenter is "presumably older" because she expresses views in line with Twenge's theory of generations, and then proceeds as if those views were evidence of generational differences. Twenge interviewed 23 young people from 12-20 for her book, but manages to turn each into a stereotype rather than a person, trafficking in particular in the trivialization of teenage girls. She describes young women as "pretty," "pretty," "beautiful" and "strikingly pretty." Instead of speaking, they "gush" or "chirp." The boys she interviews, in contrast, are "unusually focused," or "unusually empathetic for a teenage boy." The message is clear; the girls are ditzy, and the expectations for the boys are so low that they impress by merely being polite. It isn't a surprising message for a book whose animating principle is broad generalizations about an entire generation, but it is nonetheless tiresome. "Like the ducks they imitate in their selfies, iGen'ers are calm and composed on the surface but paddling madly underneath," she writes. That tone – melodramatic but still trying to stay down with the kids – is found throughout, as when she reports in a tone of bemused alarm that kids sometimes ask each other to send "noodz." But in spite of the clumsiness of her own writing, Twenge likes to deride the expressive abilities of young people, saying that more of them may know the right emoji than facial expression for a situation. Maybe, but surely one of them could come up with a better name for themselves than "iGen'ers." Ah well. Homer wrote: "As the generations of leaves, so are the generations of men." Teenagers will keep duckfacing, noodz will be shared, Twenge will collect consulting fees, academics will keep publishing careful rebuttals of her research that no one reads, and the world will probably keep on turning. Don't worry, iGen: There's always someone next.